Shock absorbers do what their title implies: they help control the movement of your vehicle’s springs as they compress and rebound during vehicle use. Without shock absorbers, a vehicle would be virtually unusable and extremely uncomfortable. You should have your shocks inspected once a year. It’s a good rule of thumb to have your shocks inspected while having a wheel alignment performed. Some signs that your vehicle may have worn shocks include excessive bouncing, rocking back and forth, drifting or nose-diving while braking, swaying, or cupping wear on the tires. Springs support the weight of the vehicle and allow the suspension system to move and adapt to road irregularities, compressing when the wheels hit a bump and expanding when the wheels encounter a dip. Springs can break as they age, and generally weaken over time. A good rule of thumb is to have the automobile’s springs inspected during a wheel alignment. Bad springs can cause abnormal tire wear, and cause the car to bottom out. 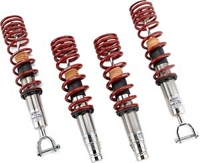 The struts have both springs and an internal shock absorber so they act both as a spring and a shock absorber while also acting as an assembly for various components of the suspension system. 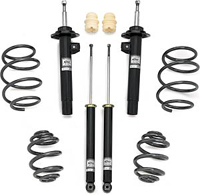 Most newer vehicles use struts, but many new SUV’s and trucks still use the traditional Shock Absorber and Spring system. Like springs and shock absorbers, struts wear out gradually over time and you should have them inspected with every wheel alignment.